Which raises another important question, since Obama is a government employee, does he have to contribute to the White House coffee fund? 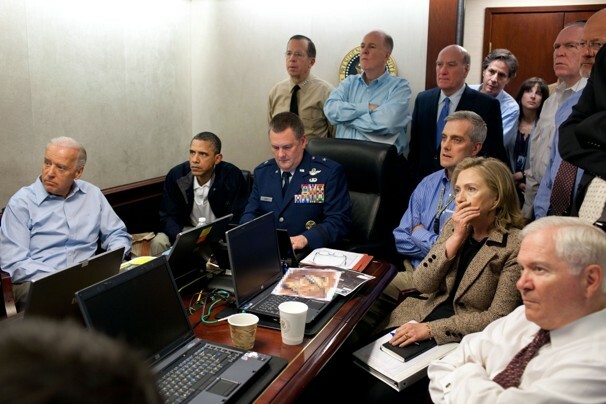 Finally, do not skip the funniest 'Situation' Room meme mash-up ever. Make sure to scroll through them all. 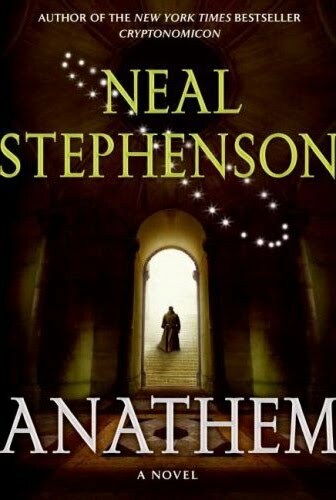 As a follow-up to my annual Just Read More Novels Month, I gave myself the challenge to read all of Neal Stephenson's Anathem in less than one month, and that month happened to be February. I did make the challenge, but only just barely. The novel is nearly 1,000 pages long and is a sweeping science fiction world with tons of new jargon and concepts. But I did make it and I'm glad that I did. The central conceit of the alternate world where Anathem is set is that science and math and many other forms of learning are restricted to monastic orders. They have a complicated hierarchy based on how extreme their isolation from general civilization is. But then inexplicable events start happening and the order of the world that had kept civilization from self-destruction for three thousand years begin breaking down. The first hundred pages of the book are tough slogging as the reader has to piece together the social structure and the relationships of the characters. And then the roller coaster ride begins. Each chapter unfolds a little more and an epic journey begins. This is classic world-buidling science fiction at its best. The only rough point is that there is a poorly handled romance that runs beneath the main plot line. These monastic scientists seem to not do well with the ladies despite their co-ed enclaves. Other than that, everything in this world ties together. It is tightly plotted so that events and casual conversations tie into events later in the book. There is also a great deal of philosophical noodling going on. It helps to know enough to figure out who the Anathem world analogues are to our philosophies and philosophers, but it's not entirely necessary. Just be prepared to have your thoughts provoked on this wild ride. As a palate cleanser I picked up Troll Bridge a "young adult" novel which looked like a modern update on the Three Billy Goats Gruff story. I love that story. I used to re-enact the story with gummi-bears with the troll (me) eating lots of gummi-goats. In this version of the story, the goats have been replace by a boy band suspiciously similar to the Jonas Brothers. While this is a clever concept, it's never really exploited well. Instead the plot riffs on some other much less known fairy tale about dairy princesses and and deals with trolls. 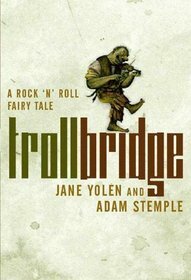 Jane Yolen is a well known children's author and Adam Stemple is her musician son. While I assume his role is to add lyrics for the band in the book, the overall effect is a disjointed mess. I just wanted to hear some clip-clopping across the bridge and I end up with fiddle playing evil foxes and trolls stupid even by troll standards. Joel Achenbach is a star reporter at the Washington Post, and while he doesn't like me saying so, he's their best reporter who has never won a Pulitzer. And in a world where Gene Weingarten has two that is a major oversight. One of his many beats is natural disasters of all kinds. He has written for National Geographic about the Yellowstone supervolcano caldera and covered Hurrican Ike for WaPo from Galveston. He spent much of last spring and summer (with Stephen Mufson and others) covering the disaster which was the BP Macondo Oil Spill. For months he translated the lingo and the technology of the oil well drilling business for all of us wanting context and information. He has leveraged his research into a book which in his glorious trademarked understated style is titled A Hole At The Bottom Of The Sea. Rather than delve into the minutia of the crisis, he gives a broader big picture of the players and the forces at work. After the initial tour de force you-are-there account of what actually happened that fateful night, he focuses on the interplay between BP and the government. While both parties wanted the oil well capped, there was a lot of tension between the groups. Achenbach has captured the interplay between the dirty fingered roughnecks of the oil industry and the ivy tower Whiz Kids of the Obama administration riding herd on them. One of my obsessions during this crisis was the ongoing circus sideshow about how much oil was actually flowing. BP had a clear fiscal interest in either never finding out or doing there best to minimize the estimate. Portions of the book do go into the wrangling over how and what was released to the public. The narrative has a crisp fast-paced tone. Achenbach lucidly tells a polemic-free tale of people banding together to solve a crisis which had many fathers. Perhaps the one weakness of the book is that it eschews finger-pointing and blame-placing. And maybe it truly is too early to resolve those issues. But the book is a good clarion call about how we need to have better responses in place so that future crises such as the post-tsunami nuclear event in Japan can be more effectively dealt with. I recently watched the film version of Ghost World costarring a young Scarlett Johansson as a bored teenager dealing with the bleakness of modern existence. 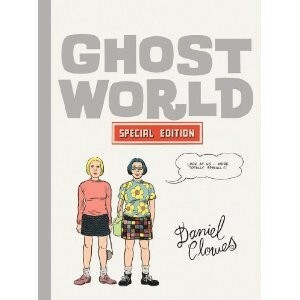 To get a better feel for the story, I read the collected graphic stories the movie was based on. The movie has a stronger narrative arc than the comics which have a bleaker angstier feel. The pages just drip with disaffected ennui. The stark black and white graphics are particularly good at evoking a moody sterility. Most surprising to me was how few Ghost World stories there are. The actual stories don't even take up half of the super-sized Special Edition which I read. The remainder is extra material as well as the movie shooting script which I did not read. Clearly the characters of Enid and Rebecca resonate and feel very real. For quite a while the comic book universes have been goosing sales with epic multi-issue Event storylines where everything as you know it is overturned. 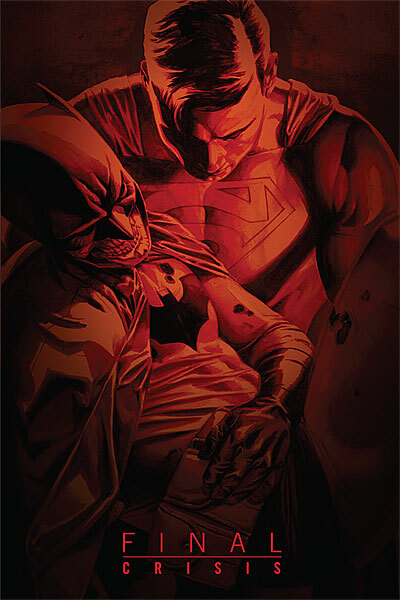 One of the most recent of these in the DC universe was called Final Crisis, which I suspect is a little disingenuous since crises are part of their stock in trade. Once again an evil force threatens to destroy multiple universes and only the combined might of Every Hero Ever can stop it. Part of the fun of these over-the-top exercises is playing trivia in trying to identify all the odd cameos. And this one meets that and more. For example, Black Lightning who I had never heard of gets nearly a whole issue to himself. Part of the fun is trying to figure out if the more obscure characters are just forgotten trivia items or ones invented solely for this story. For an epic storyline to succeed it has to wreck major havoc and changes which won't be retconned out the next issue. In the case of Final Crisis, the major change seems to be the return of the Barry Allen Flash who met his end in the granddaddy epic story Crisis on Infinite Earths about thirty years ago. Other than than that the rest of the seven issues seem to just be an exercise in excess. Once the universe has been nearly destroyed dozens of times earlier, it's just hard to work ups some suspense over yet another Final Crisis. Perhaps the best way to enjoy a book by a comedian is to listen to the unabridged audiobook by the author and there is no better example of this than Bossypants by Tina Fey. While the words are hilarious, her inflection adds miles. Roughly autobiographical, it details her rise from summer drama camp fag hag to the star, writer, and creator of the most inventive sitcom on television. Along the way she peppers the story with sidebar stories and digressions which all seem to be about the hurdles women still have to face in a post-feminist working environment. This quiet undertone of rage permeates the book. She talks about her time with Amy Poehler on the Second City tour bus and the disgusting sanitary habits of the Saturday Night Live male writers. The book is perhaps a little guarded. There is as much she leaves out as she puts in. In some cases, such as the childhood attack which left her permanently scarred, she says she won't talk about. Other events she just doesn't mention at all like cutting Rachel Dratch from the cast of 30 Rock. It's a rollicking hilarious book and well worth listening to in her own words. 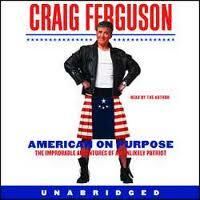 Another hilarious comedian with a memoir is Craig Ferguson, the Scotland born and recently naturalized host of The Late Late Show. Contrary to Tina Fey, there seems to be nothing Ferguson is not willing to air. He narrates every drunken binge, bad acid trip, and ugly relationship break-up he ever had. At some point the tales of his bad behavior become a little tedious, but that all makes his decades of sobriety all the more amazing. The rough narrative is about his youth in Glasgow as an aspiring punk rocker and the transition to stand-up comedy which leads to his becoming a minor star in Great Britain before breaking into the US market as the foppish jerk on the Drew Carey Show. The book is alternately funny and maudlin. As a writer, Ferguson is overly fond of the adjectives 'farty' and 'wee', but I will attribute that to his Scottish background. As the title American On Purpose attests, the undercurrent of his book is his long-abiding and deep love for all this American. Throughout he talks about his love of our freedom and opportunity. After all, in a country where Craig Ferguson can become a late night talk show host, anything is possible.